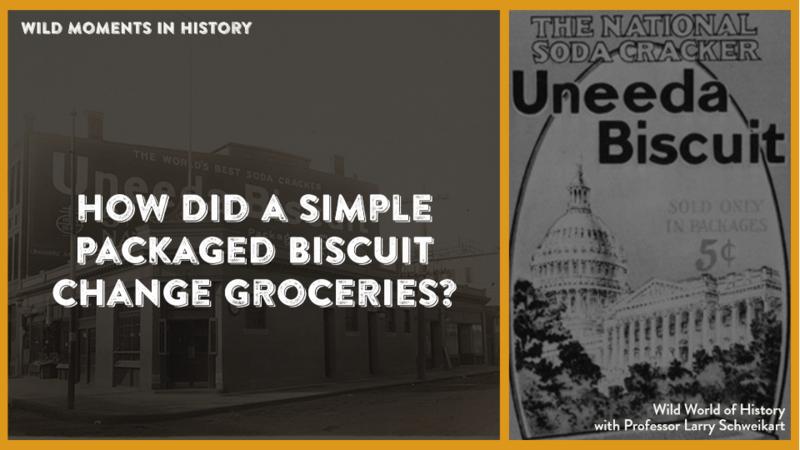 Did you know that Uneeda Biscuit changed the way Americans ate and shopped? In 1898, the Chicago American Biscuit and Manufacturing Company and the New York Biscuit Company, and the United States Biscuit Company were merged. The president, Adophus Green, was looking for a way to deliver fresher cookies and cracker products, and Frank Peters created a package for him of folded wax paper and cardboard. Peters nicknamed this the “In-Er-Seal” Package. To market this new product, Green named it “Uneeda Biscuit”. Little did Green know he had just revolutionized how people both ate and shopped. Prior to that time, housewives (mostly) did the shopping and would go to a grocery store where all the products were either out on counters—exposed to the air—or in large pails or tins to be scooped out by the clerk. Cheese was in large wheels, which the grocer cut to order. In more remote areas, however, it was not uncommon for a grocer to have a livery service and to come in to fetch various food items with his hands still contaminated. But even in the best of stores, pickle juice dripped into the flour as pickles were plucked out, cheese wheels sat for days, and kerosene was dispensed with the same ladles as milk. Now, for the first time, crackers and cookies could sit for very long times on shelves and maintain their freshness. Moreover, before long Gustavus Swift, the Cudahy Brothers, and James Kraft were wrapping their meats and cheeses into separate packages that retained their freshness. John Dorrance at Campbell’s soup had also devised a method to extract water from soup mixtures based on the same principles as used by Gail Borden some 40 years earlier to condense milk. Soon, merchants’ shelves were stocked with pre-wrapped, pre-packaged, and canned goods. Women could now shop on their own, without the need of “advice” or help from a (usually male) clerk. Grocery stories, with shelves of canned goods, took on an entirely different look—all because of Uneeda Biscuit.